WOODBRIDGE, VA. (SEPTEMBER 2, 2015) - Shortstop Gleyber Torres is the top-ranked Cubs prospect according to MLBPipeline.com, and on Wednesday, the Cubs promoted the 18-year-old from Class-A South Bend to join the Myrtle Beach Pelicans, Class A-Advanced affiliate of the Chicago Cubs. Torres highlights a bevy of roster changes for Myrtle Beach. Outfielder Jeffrey Baez, who has led the Midwest League in OPS in the second half, joins Torres in Myrtle Beach as well. Prior to the start of the season, Baseball America named Torres the number six prospect in the Cubs system, and, after the "graduation" of many of the Cubs top prospects, MLBPipeline.com now lists Torres as the Cubs overall top prospect. Chicago signed Torres as an international, non-drafted free agent out of Caracas, Venezuela, on July 2, 2013. Entering play on July 10, the native of El Tigre,Venezuela, was hitting just .176. Since then, the right-handed hitter is batting a robust .388 (75-for-193) with 42 runs scored, seven home runs, and 26 RBI. Since that date, he is 15th among full-season minor league players, second in Class-A, and tops in the Midwest League in OPS (.989). In his last 44 games, he's posted 26 multi-hit efforts, including two four-hit games. To go along with his other offensive skills, Baez can run, as he has 34 steals in 44 attempts, with 25 of his steals coming in the second half, and 13 in his 26-game month of August. The Chicago Cubs signed Baez as an international, non-drafted free agent on July 7, 2010. Penalver, 21, was named "Best Defensive Infielder" in the Chicago Cubs farm system by Baseball America to begin the season. The slick-fielding native of Aragua, Venezuela, departs the Carolina League as a .197 hitter with 16 extra-base hits, including two home runs, one of which was a walk-off long ball on July 30 against the Potomac Nationals. He drove in 42 runs, fourth-most on the club, and has swiped 11 stolen bases in 19 attempts. The 6-foot shortstop logged 114 games with the Pelicans, all at shortstop. The Chicago Cubs signed Penalver as an international, non-drafted free agent on July 2, 2010. With the moves, the Pelicans' roster remains at 25 active players, the Carolina League limit, and includes four players on the disabled list. Penalver and Brown join a list of 15 other players to earn promotions from Myrtle Beach this year. Starling Peralta, Matt Brazis, Jacob Hannemann, Gerardo Concepcion, Wes Darvill, Billy McKinney, Tayler Scott, Zach Cates, Cael Brockmeyer, Jeimer Candelario, Juan Paniagua, Jacob Rogers, Fernando Cruz, and James Pugliese have all been promoted to Tennessee this season, and Michael Heesch is the only other Pelicans player to skip Double-A and make a stop in Triple-A Iowa. Brockmeyer, Heesch, and Rogers have all returned and are on the active roster. 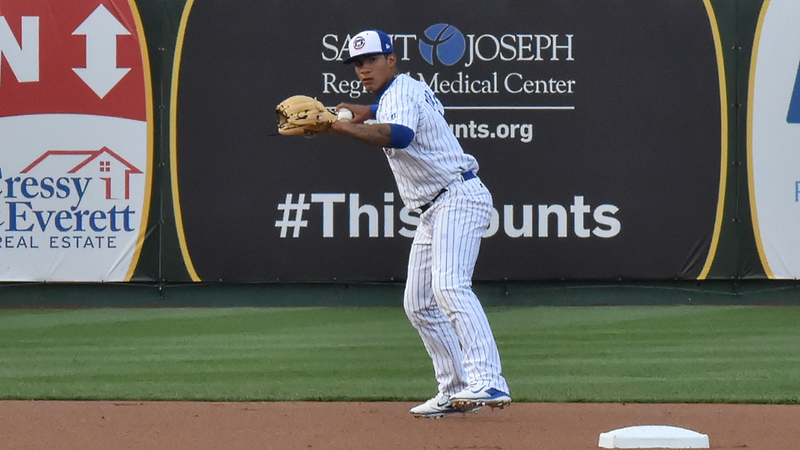 Torres and Baez are both active and will be in uniform for the Pelicans tilt on Wednesday with the Potomac Nationals. Torres will play shortstop and hit ninth, while Baez is in center field and is hitting sixth. The game can be heard live on 1450 WRNN-AM ESPN Myrtle Beach, on the TuneIn Radio App, and via the MiLB First Pitch App, beginning with the Pregame Show at 6:45 p.m. ET. First pitch is slated for 7:05 p.m., and Midseason All-Star Jonathan Martinez, who leads the league in ERA entering the day, returns from the disabled list to make the start. Click here for a current schedule of the Pelicans' remaining regular season games.